Dear Francy; Mom is so sad that she no longer has her garden…she talks about it all the time. I just wish I could gift her a day in the dirt…any ideas for a gal stuck in a wheelchair? Yes….get her out the door on your front or back porch and put some veggies in a container. Even if it’s just some herbs…she will feel a part of it again if you hand her the hose and let her water each morning or evening. Here is a fun recipe from our garden…George loves to sit on the porch and watch his garden grow and so when we cut our first squash today — we had to bring it in and make it into a meal! What I love about cooking these days is I cook for four or six…then I freeze a couple of the left overs as meal size portions. When I have a day that is stress filled and I’m tired. 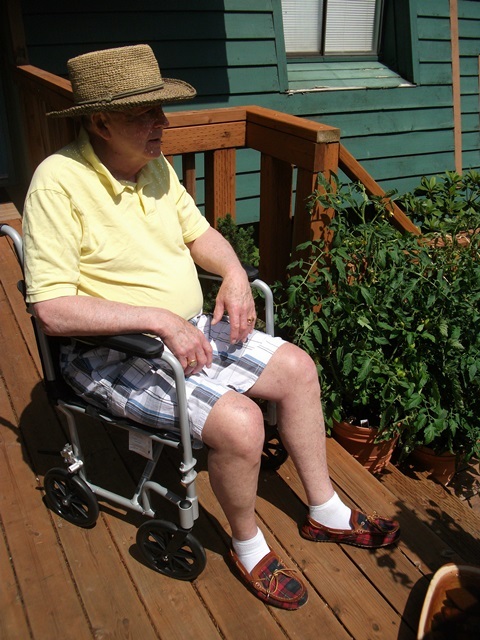 I am able to go and get one of the home-made dinners and George can enjoy the moment all over again. I served this meal with a French roll. I find buying a couple of French rolls is so much easier than trying to finish off a big loaf of French bread. 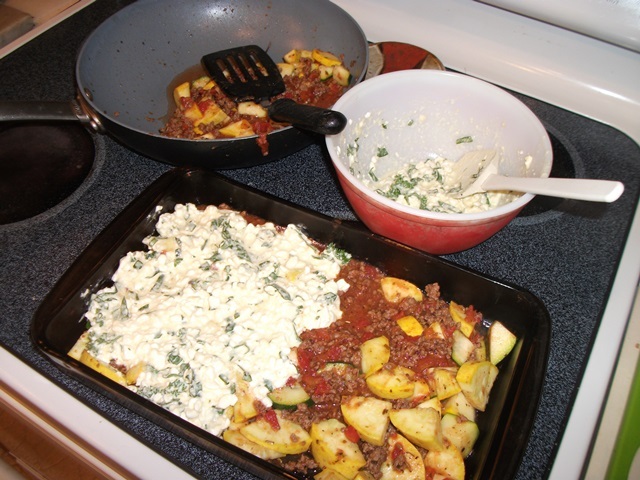 I know both you and your senior will enjoy this meal…its fun to use your own (or local) summer squash and this is a hit with George. Turn the oven on to 350 and get a 9 x13 pan greased and sitting aside. Start the hamburger browning on medium, on the stove. Break it apart so it is in small pieces as it cooks. Add the seasoning combo of salt, pepper and garlic..then when it’s brown…mix in the small chopped onion pieces and the fennel. Let it all brown together. (drain off the excess oil) Add in the squash pieces – that are cut in inch cube size – and the can of stewed tomatoes. Stir for two minutes to bring the flavor of the mix together than take off the burner and let set while you make the cheese layer. Cheese Layer: 1 Small carton of small curd cottage cheese – 1 beaten egg – a few fresh leaves of basil cut with scissors into small strips- a large sprig of parsley from your container, cut with scissors. 1/4 cup of Parmesan cheese. Mix all of this together and add pepper and salt. Layer 1/2 the veggie and meat mixture in the greased pan. Top that with the cheese layer dotted all over the first layer and then spread out. Layer the rest of the veggie and meat mixture and top it with the 1 cup of tomato sauce (or canned spaghetti sauce) and sprinkle that with the Italian Seasoning. Top it with shredded mozzarella cheese and if you have some shredded fresh Parmesan you can mix that in with the other cheese. Sit the pan in a baking pan to prevent dripping (the squash really adds moisture to this dish, so you do not want to have it dripping in the oven as it bakes.) 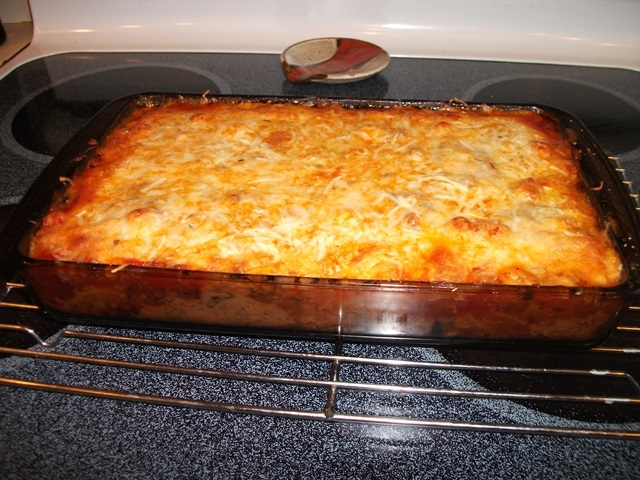 Bake for 45 minutes on 350 –watching the cheese so it browns but does not burn. Take it out and let it set for about 5-10 minutes so it will cool and set so it is easier to serve. I take the French roll – butter it and sprinkle with garlic, Parmesan cheese and Johnny’s Seasoning…and wrap in foil…put in the last 10 minutes so it can be warm and toasty…YUMM. I usually serve George at his chair in the living room. I have a good tray that I use and I always line it with a towel or napkin and make it look as nice as I can. Eating when you are a senior..is a hard chore…many times seniors lose their ability to taste…so this is a great Italian seasoning meal that is tasty and fun for the senior to eat. Since it’s made of veggies I do not make a side salad..and because its quite rich…I let George eat…rest and then have his coffee with a couple of cookies later. I always put his pills, on the tray…so he can see them and remember to take them after the meal. 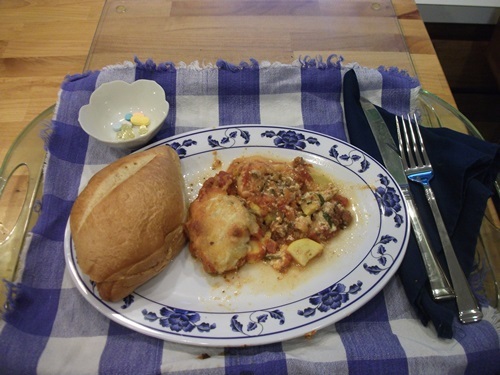 Italian is a fun way to mix up dinners for seniors that get so tired of everyday meals. 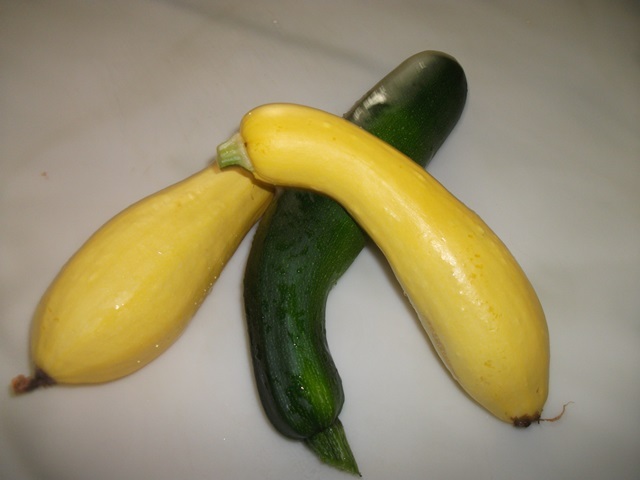 Plus the use of the veggies that they helped raise…with their daily watering…and love…makes the dinner even better. I understand that as the senior advances in his medical complications…eating spicy foods can be hard on the stomach. I did not use many spices in this and you could always leave out the garlic completely. Just work around it and then remember the dinner is fresh and the left overs are perfect frozen dinners for next week.